The Harmony Headlands State Park Trail is easy to find. It’s located near the coastline in San Luis Obispo County, CA. 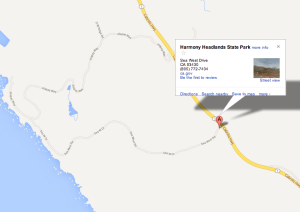 The main trail starts at a parking lot about a mile south of Harmony on Highway 1 between Cambria and Morro Bay. 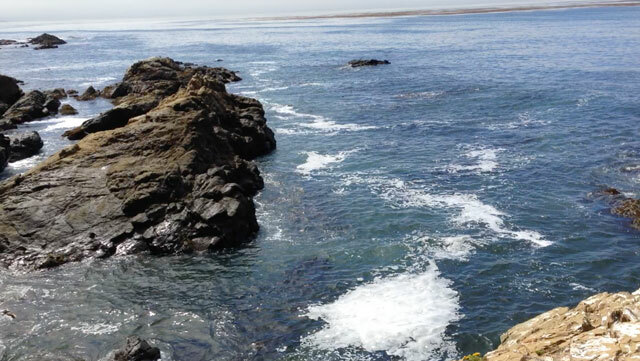 It’s a two mile hike from the highway to the scenic coastline, making it a four-mile round trip. It’s a wide and comfortable trail made of compacted dirt. It has slight rolling hills making it perfect for beginners, families and even strollers. The trail has diverse and unique habitats supporting rare, endangered and sensitive plant and animal species. Along the rocky outcrops, lichen, ferns and Indian paintbrush are scattered throughout the grasslands. In the fresh water habitats of wetlands, riparian corridors and ponds, willows, rushes and cattails can be seen. Along the intertidal areas, sea mammals can be seen and heard. Overhead seabirds and shorebirds soar. Making their way through their grassland homes, California ground squirrels, brush rabbits, skunks, coyote, mule deer and raccoons are among the residents. On our hike we saw squirrels, rabbits, deer, a sea lion and lots of wildflowers. It took our family about an hour and 40 minutes for the round trip of this beginners hike. There were lots of places to stop and enjoy the wildlife and panoramic views. There are several benches for resting on the path and a portable bathroom a short distance from the beginning .Be sure to bring a bottle of water, hats and sunscreen. The ocean view from Harmony Headlands. The park is open for day use hiking from 6am to sunset. A small parking lot is visible along the west side adjacent to the southbound lane of Highway One. The parking lot can accommodate approximately 10 vehicles. See more details at California State Parks. The park is open from 6 a.m. to sunset. No dogs, horses or bicycles in the park. No camping or camp fires allowed. Wear layered clothes to accommodate weather. Beware of ticks: Avoid bushes and grasses. Stay on the trail: Do not enter sensitive wetland areas.